Successfully Added Rofvape Mod Kit A Box Mini - 80W, VW + VT Mod, Ti / Ni / SS316 Mode, Overheat Protection (Black) to your Shopping Cart. Rofvape has a mission to improve the standard of vapes bringing a higher quality of e-cigarettes suitable for everyone from novice to enthusiasts and with the A Box Mini kit they have a vaporizer that is suitable for all. This 80Watt mod kit is made from a zinc alloy and has a large temperature range from 200 to 600 degrees Fahrenheit. The 510 type thread means the mod and atomizer can easily be swapped out allowing you to incorporate it into your other kits. The A Box Mini vape is a lightweight and versatile, able to work as a VW as well as VT mod this vape kit has VT-TI/VT-NI and VT-SS modes. Despite its small size you can make huge vapor clouds thanks to the mod's 80W power, that is drawn from a rechargeable 18650 battery, (not included). With easy controls and a clear 0.69-inch display, you can adjust the temperature and wattage with instant feedback. The screen also offers up extra info such as power mode and battery charge remaining, with a memory mode that will recall your last used settings this vape kit is always ready to go. There are 8 levels of protection built into this vaporizer that prevents dry burning, overheating, overcharging, short circuits, and over time protection as well as alerting you to incorrect battery installation. What's more, with the ability to lock the control buttons you won't inadvertently activate the e-cig when it is in your pocket or bag. A 5.5 ml clearomizer atomizing tank has plenty of capacity and the rechargeable 18650 battery will be sure to keep you vaping for days on end. With its adjustable air flow regulator and easy top fill design, this vape can be topped up without any mess. Coming with additional coils and capable of supporting 0.5 ohm / 0.2 ohm / 0.3 ohm Resistance the atomizer is suitable for a wide range of setups. 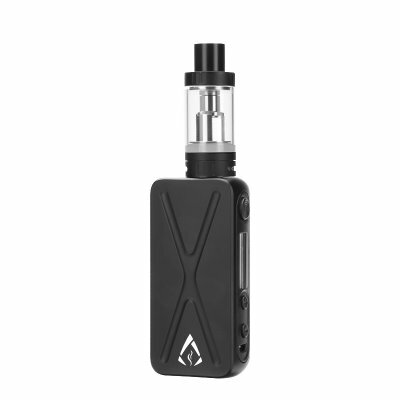 This Rofvape A-Box Mini Vaping Kit by comes with a 12 months warranty, brought to you by the leader in electronic devices as well as wholesale vaporizers and vaping kits..